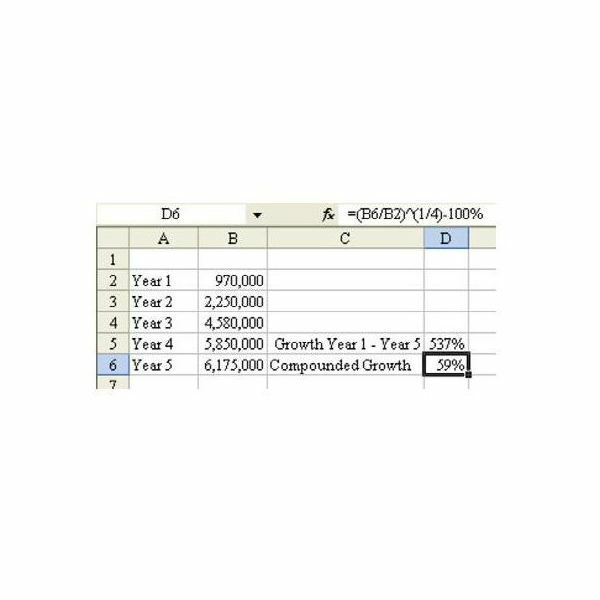 Even though there may not be a predefined function in Excel that allows to calculate a growth rate, we can still use the application to solve these kinds of problems. Read on to find out how. 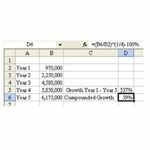 The object of this Excel lesson is to explain how to use the spreadsheet application to find a compounded growth rate. One of the easiest ways to do this is use a working example, so we'll start out with the following scenario. Problem: You work for a fast growing company. In the first year, they had $970,000.00 in sales. In the fifth year, they had $6,175,000.00 in sales. What was the compounded annual growth rate? Now, we'll move on to showing how to solve this problem in Excel. The compounded growth rate is 59 percent. Summary: Compounded growth rates are common calculations that require you to raise a number to a fractional power. 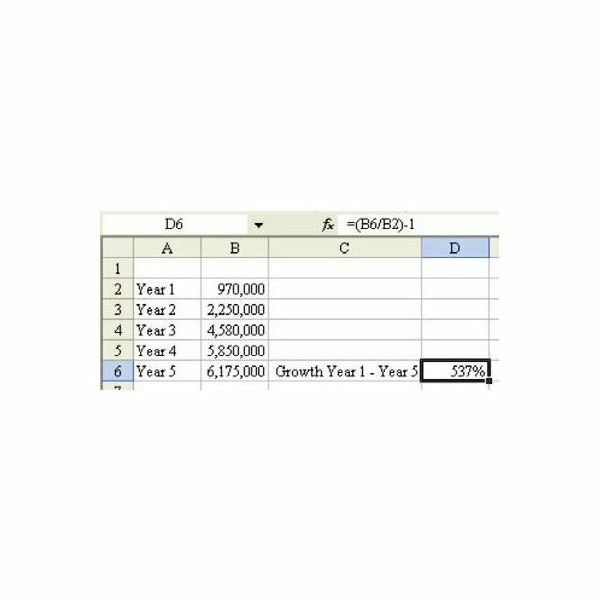 For similar tips, see 91 Tips for Calculating with Microsoft Excel. 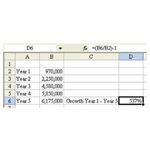 Written by Bill Jelen (also known as Mr. Excel), this collections of short, easy tutorials shows how to solve a variety of different problems in Excel – ranging from common calculations to more complex scenarios. Looking for more Microsoft Excel user guides? Be sure to browse through the other tutorials available at Bright Hub, including how to create various Excel charts and graphs and how to perform an Excel Pareto analysis. New and updated material is added on a regular basis, so bookmark us and check back often. If you're thinking about upgrading to Office 2010, you may also want to take a look at Bright Hub's collection of Microsoft Office 2010 user guides and other resources. Even if you decided to skip the Office 2007 upgrade and stick with an older version of Microsoft's office suite, Office 2010 has a few new features that just might be worth the wait. Learn what these new features are in addition to finding out how well the newest release of MS Office stacks up to its predecessors.